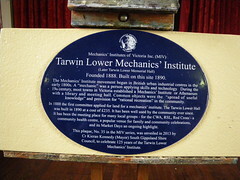 Tarwin Lower Mechanics' Institute (Later Tarwin Lower Memorial Hall). Founded 1888. Built on this site 1890. The Mechanics' Institute movement began in British urban industrial centres in the early 1800s. A "mechanic" was a person applying skills and technology. During the 19th century, most towns in Victoria established a Mechanics' Institute or Athenaeum with a library and meeting hall. Common objects were the "spread of useful knowledge" and provision for "rational recreation" in the community. In 1888 the first committee applied for land for a mechanics' Institute. The Tarwin Lower Hall was built in 1890 at a cost of £235. It has been well used by the community ever since. It has been the meeting place for many local groups - for the CWA, RSL, Red Cross - a community health centre, a popular venue for family and community celebrations, and its Market Days an ongoing highlight. This plaque, No. 35 in the MIV series, was unveiled in 2013 by Cr Kieran Kennedy (Mayor) South Gippsland Shire Council, to celebrate 125 years of the Tarwin Lower Mechanics' Institute.